Manchester’s LoneLady (aka Julie Campbell) was one of the acts who appeared at the inaugural Bluedot Festival in July 2016 – an arts, music and science jamboree in the shadow of the famous Lovell Telescope at Jodrell Bank. In advance of the event, I interviewed her for the festival’s official preview magazine. LoneLady is on the move. The studio she refers to is also her home – a flat in a Manchester tower block. It’s where she recorded her two albums for Warp – where the tight, tachycardiac pop of 2010’s Nerve Up transformed into the deeper post-punk pulse of last year’s Hinterland. It’s where her fascination for the bleak backdrops of unregenerated, outlying Manchester became an obsession that mutated into her muse. And it’s where her own personal metamorphosis – from LoneLady to Julie Campbell and back again – occurs daily. As a jocular aside, I suggest that perhaps she’s decamping to “a garden suburb in Cheshire or something”. No one who knows the desiccated urban groove of Hinterland could be surprised at Campbell’s emphatic denial. Hers is sparse and anxious music that resonates with the reflected echoes of Manchester’s forgotten zones, and I suspect that if she found herself pruning roses round a quaint cottage doorway, it would be a sign that her musical powers had gone absent without leave. With this in mind, I ask Campbell what Manchester means to her. If the album’s title refers to the Manchester that lies beyond the buzz and bling of its busy central districts, does it also hint at a more personal sense of isolation? It’s clear then that specific physical spaces matter a lot to Campbell, but where on pop’s timeline might we find her musical influences? 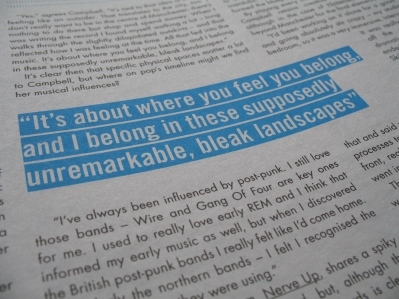 The debut LoneLady album, Nerve Up, shares a spiky dance-pop skeleton with Hinterland, but though the rhythmic scratch and scrape of both records is clearly rooted in the sound of those early-80s innovators, Campbell also credits necessity as the mother of Nerve Up’s invention. By playing every instrument except for drums herself, Campbell retains creative control over her output, although in the case of Hinterland it took a trip way beyond Manchester for the final elements to be applied. “I’d been working on it alone for a good 18 months and going absolutely stir crazy – my studio is also my bedroom so it was a very immersive, internalised process. It was really helpful to finish off the record somewhere dramatically different, so I ended up working with Bill Skibbe in Michigan. The completion of a record capable of elbowing its way into almost every album of the year line-up is one thing, but turning such a self-created work into a powerful stage experience is another. 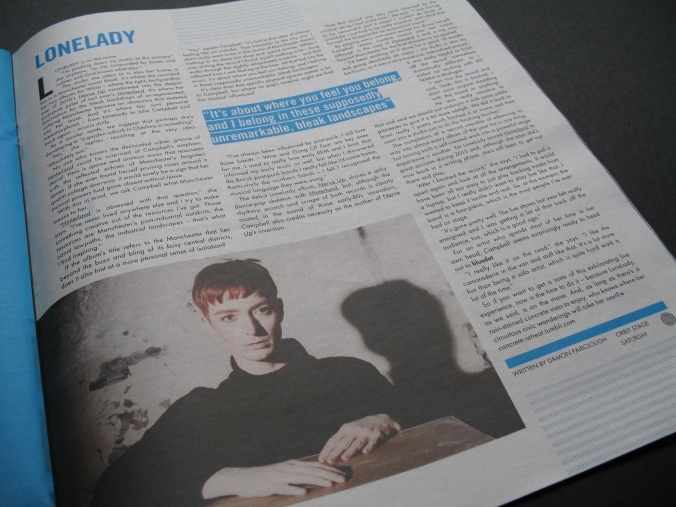 Yet LoneLady toured Hinterland to great acclaim during 2015 and, though she says she’s now back in a writing phase, she’s still keen to get out there and play. “After I finished the record,” she says, “I had to pull it apart again and look at all the arrangements. It would have been all too easy to just play backing tracks from a laptop, but I really didn’t want to play live like that. I wanted to keep it tactile and real. So at the moment the band is a four-piece which is the most people I’ve ever had on stage. For an artist who, so she tells me, spends most of her time in her own head, Campbell seems surprisingly ready to head out to Bluedot at Jodrell Bank. So if you want to get a taste of this exhilarating live experience, now is the time to do it – because LoneLady, as I said, is on the move. And so long as there’s a rain-stained concrete vista to enjoy, who knows where her circuitous civic wanderings will take her next? This piece originally appeared in Bluedot Volume One, the 2016 Bluedot Festival preview publication. 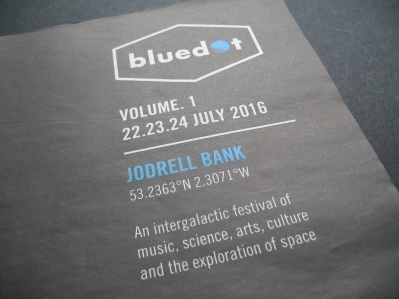 The Bluedot Festival took place at Jodrell Bank, Cheshire, over the weekend of 22-24 July 2016.